I was taking a look at the new VSAN that I build (3-node of HP DL380 Gen 9), and I noticed an error message on the host/cluster. This was after I resolved the driver issue, so I knew it was something new. From this screenshot, you will see that at the cluster level you see VIrtual SAN Health errors. At the Virtual Disk Level, the compliance for all of the disks is Noncompliant and there are missing components (data or witness). Since I only have three nodes, the failure in the one node means that there are not enough nodes to rebuild the components. 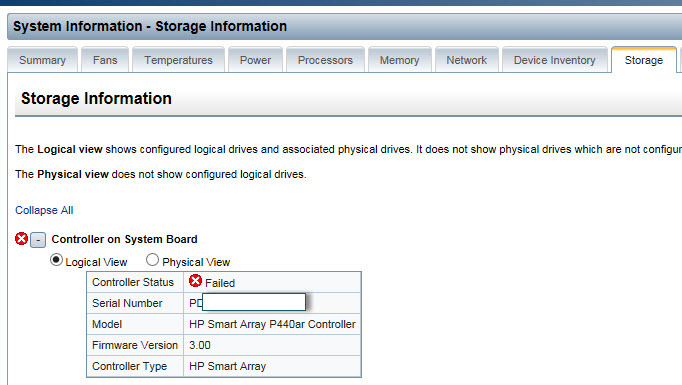 Lastly the HP Smart Array P440ar Controller itself showed as failed. I used a pre-canned query from the VSAN Content Pack for Log Insight and then went to the event trends. There wasn’t anything specific to the hardware, but you could definitely see all of the VSAN errors. At this point I opened a ticket with HP and collected the AHS logs. When they reviewed the logs, they told me that I didn’t have a failed controller, I hit a known issue. Apparently there was an updated array controller firmware that was released but was not part of the SPP disk (released after the SPP) but it WAS part of the HP Recipe. There is a footnote in the recipe that the firmware had to be downloaded separately. I started reviewing the recipe and was set to download the firmware that was extra, but got distracted with this VSAN setup and just used the SPP as is. After using the VMware online components to apply the firmware, the array controller was back in action, all green in the Health Checks. @ikiris how do you mean? it checks against the HCL as it stands today? VSAN Health Check worked great to notify me that I was using the wrong array driver (as determined from the HCL for VSAN), but there wasn’t a lot of checks for other firmware or drivers. I was trying to follow the November 2015 HP recipe guide, but I was missing the correct array firmware. What would be really awesome is if Health Check could be loaded with HP’s recipes and tell me that I was using the wrong firmware/driver and if there were any related advisories to the firmware/driver that I was using. I haven’t used HP OneView for vCenter, but from what I can tell it displays software/firmware but it doesn’t match it against a preferred configuration. Maybe I’m looking for some sort of mash-up of VSAN Health Check and HP OneView. This happened to us on the 5th although in our case HP did replace the controller, once it was back in we reconfigured for HBA and everything came back up. Did you end up patching the firmware?